LINDSAY: No-Family Doctor Immunization Clinic, Tuesday, April 2, Health Unit office (108 Angeline St. S.) in Lindsay. Free immunization clinics for families without a doctor. To book an appointment, call the Health Unit at 1-866-888-4577, ext. 1507. LINDSAY: Sexual Health Clinic, Thursday, April 4, 4:30-6:30 pm. The clinic provides clients with confidential access to cervical screening, low-cost birth control, pregnancy testing and sexual health teaching. Testing and treatment of sexually transmitted infections are also provided. For more information, locations or to make an appointment, call the Health Unit at 1-866-888-4577, ext. 2205. LINDSAY: Sexual Health Clinic, Monday, April 8, 10 am to Noon. The clinic provides clients with confidential access to cervical screening, low-cost birth control, pregnancy testing and sexual health teaching. Testing and treatment of sexually transmitted infections are also provided. For more information, locations or to make an appointment, call the Health Unit at 1-866-888-4577, ext. 2205. LINDSAY: Sexual Health Clinic, Thursday, April 11, 1-3 pm. The clinic provides clients with confidential access to cervical screening, low-cost birth control, pregnancy testing and sexual health teaching. Testing and treatment of sexually transmitted infections are also provided. For more information, locations or to make an appointment, call the Health Unit at 1-866-888-4577, ext. 2205. LINDSAY: Men’s Sexual Health Clinic, Thursday, April 11, 5-7 pm, Health Unit office (108 Angeline St. S.) in Lindsay. This sexual health clinic provides men with testing/treatment for Sexually Transmitted Infections and a chance to discuss their sexual health issues with a nurse. Appointments preferred, but walk-ins welcome. Call 1-866-888-4577, ext. 2205, for more information. LINDSAY: Food Handler Course, Tuesday, April 16, 9 am to 4 pm, Health Unit office (108 Angeline St. S.) in Lindsay. This course teaches participants how to handle and prepare food safely. Upon successful completion, participants receive a certificate (valid for a period of five years) indicating they are registered as a certified food handler. Cost is $40 per person. For more information and to confirm space availability, call the Health Unit at 1-866-888-4577, ext. 5006. LINDSAY: Sexual Health Clinic, Thursday, April 18, 4:30-6:30 pm. The clinic provides clients with confidential access to cervical screening, low-cost birth control, pregnancy testing and sexual health teaching. Testing and treatment of sexually transmitted infections are also provided. For more information, locations or to make an appointment, call the Health Unit at 1-866-888-4577, ext. 2205. LINDSAY: Sexual Health Clinic, Thursday, April 25, 1-3 pm. The clinic provides clients with confidential access to cervical screening, low-cost birth control, pregnancy testing and sexual health teaching. Testing and treatment of sexually transmitted infections are also provided. For more information, locations or to make an appointment, call the Health Unit at 1-866-888-4577, ext. 2205. The local health unit is urging parents to make sure their children’s immunizations are up-to-date after being notified of one laboratory confirmed case and three linked cases of pertussis in a Northumberland County family. Pertussis, also called whooping cough, is a serious bacterial infection of the respiratory system. It is easily spread through droplets in the air from the coughing or sneezing of an infected person. While anyone can get whooping cough, it is most dangerous for children under the age of one year, and pregnant women. Whooping cough typically starts with a runny nose and an irritating cough that becomes more frequent or severe, often followed by vomiting, says Marianne Rock, Manager of Communicable Disease Prevention and Control with the Haliburton, Kawartha, Pine Ridge District Health Unit. “Once a person is infected, it can take up to 20 days for them to develop symptoms,” she says. The Health Unit was notified this week that one case of whooping cough had been confirmed with laboratory testing, and that three other family members in the same household are ill with symptoms. Those ill were either not vaccinated or partially vaccinated against the virus. Whooping cough is preventable through immunization, and Rock says the reminder to parents about their children’s vaccinations comes at a time when the Health Unit has been busy sending notices to area students whose vaccination records are not up-to-date. These notices tell families that if vaccination records are not updated, or a valid exemption for medical, conscience or religious reasons is not submitted to the Health Unit, students will be suspended from school starting in April. The current cases of whooping cough are recovering at home, Rock says, and the Health Unit has been following up with anyone who may have been in contact with the family. At this time, there does not appear to be any additional cases, but she encourages anyone who develops symptoms to contact their health care provider or emergency room to arrange for testing. The Health Unit is also holding immunization clinics for students or people who do not have a health care provider. To learn more, or to book an appointment, call the Health Unit toll-free at 1-866-888-4577, ext. 1507. 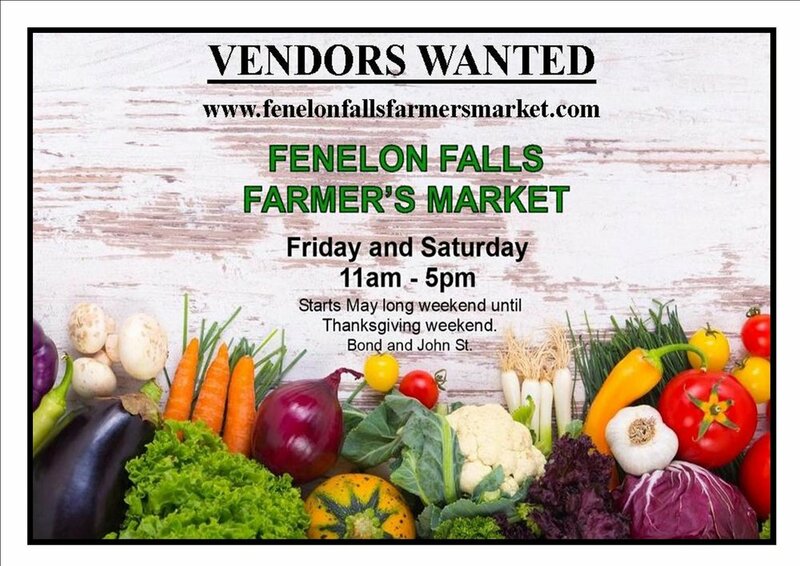 The Fenelon Falls Farmers' Market will be running both Friday and Saturday this season and we are looking for vendors. Enbridge Gas construction update: what’s new on the construction front this winter? With a true Canadian winter in full swing, the very first Enbridge customers in Fenelon Falls have had a couple of months to put their new natural gas furnaces to the test and are beginning to see the savings. Work is also wrapping up on Bond St W., and then construction will take a short break until April. The Enbridge office will remain open for customers to come in and ask questions about the project and to sign up for a natural gas service. The other option is to make an appointment with an Enbridge advisor who can meet you at your home or at the store, the number to call is 1-888-427-8888. By the end of the month, Enbridge will have installed over 31 km of pipeline (starting at Taylors Road,) as well as close to half a kilometer of pipeline beneath the Fenelon River. When work resumes, Enbridge will focus on completing the distribution system on both the south and north sides of the river, along with the installation of the service lines to the customers that have completed a gas application. It is anticipated that the entire expansion project will be complete by the end of the year. 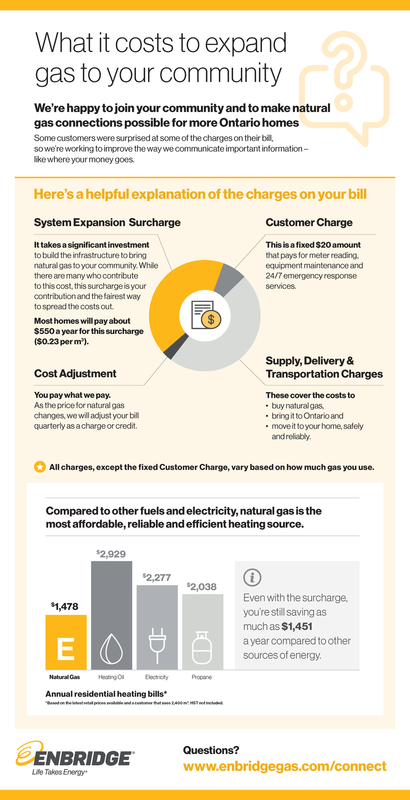 The first natural gas customers have started receiving their bills and there has been much talk in the community and in social media recently regarding the System Expansion Surcharge (SES). 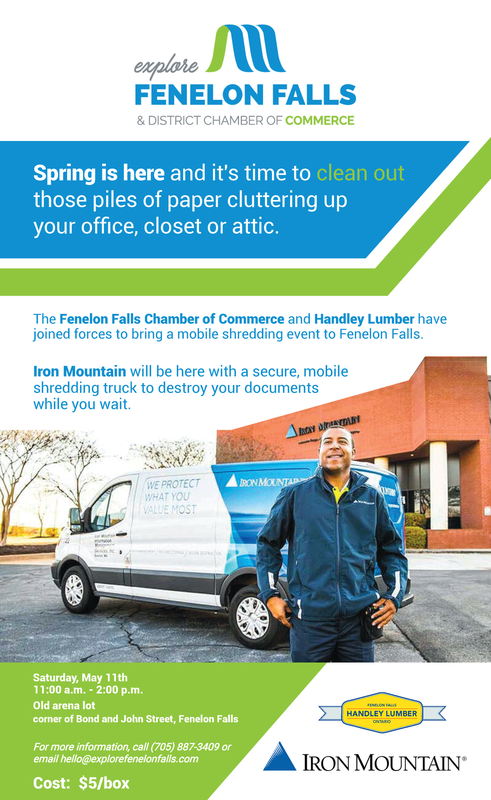 It is being applied to customers connected in system expansion areas, such as Fenelon Falls, Cambray and Cameron SES of $0.23 per cubic meter is applied and listed as a separate charge on the bill. Any new community expansion project must go through a review process with the Ontario Energy Board, and it determines whether or not the project can proceed based on projected costs and projected revenues. The Fenelon Falls project was approved because the SES provides the additional revenue required over time to make the project economically possible – without it, natural gas expansion to Fenelon Falls, Cambray and Cameron would not have been possible. It is estimated that the SES will amount to $550 a year for a typical customer, but will vary based on natural gas use. This means that it will increase and decrease based on your volume, and will be higher during the winter months. Residential customers can also choose the Budget Billing Plan where the estimated annual cost can be spread out over the year and adjusted once a year based on actual use. As with any project, there will be instances where it will not make sense to convert. For example, conversion costs can exceed expected savings or the seasonal nature of a property would keep natural gas use so low that it won’t generate lower energy bills. However, most new natural gas customers can expect to see savings in the range of $500 to $1400 annually, even with the surcharge. Pop in to the store or call with your questions to see if, and how, you can lower your energy bills with natural gas.